A Snapshot of You, Securely Stored Online - it's Your Life, in a Nutshell! A new service has just been launched which gives a number of ways to record important information online – securely, and totally privately – and which is a lot of fun at the same time. It’s a website called Your Nutshell (www.yournutshell.com), a live and growing record of you and those around you - what you were all doing, in a nutshell. The website is divided into different sections where you can record things as they happen – for instance, Your Year in a Nutshell is a kind of secure online diary where you can record things whenever the mood strikes, maybe about nights out with friends or work events or family get-togethers. List what you took on holiday and never unpacked, before you forget and do the same next year! You can upload pictures you took as well, and then invite people into that part of your nutshell to see without having to print out or email them – you say how long you want to give that person access, and to what parts of your files. As well as photographs, you can also upload video, music, audio files (such as a recorded voice blog) and documents - so it really is a total picture of what you were getting up to. Or use it as a useful tool when away from home – store emergency numbers, upload maps, traveller's cheque details, a copy of your passport – safer than a photocopy and accessible from a PC anywhere in the world simply by logging in, should you lose a bag while travelling. Then there’s Your Life in a Nutshell where you can store an online memory bank about your own life, following hundreds of prompt questions to get you thinking; who was the first person you spoke at Junior School? What was your first pet called? Were you named after anyone in the family? Once you get started it's amazing what you remember. You can set your own questions, and could even start a new nutshell for children or babies in the family – upload video of their first steps or words, or record the kids’ achievements as they happen. That would be a unique gift to pass on when they’re old enough to understand! We all keep our various policy, banking and insurance details in different ways. But here is something fire-, burglar- and flood-proof – a secure virtual filing cabinet online, Your Money in a Nutshell where you can follow prompts to upload all the contact and financial details of your assets and liabilities, what’s insured and how much it costs – and best of all, use the unique interactive budgeting tool to keep on top of your finances. Make sure the credit crunch doesn’t take you by surprise. And finally, none of us wants to think about anything happening to us or those we love – but, sadly, the unexpected can happen. In such a case, it would be wonderful to find a personal message from someone taken ill, or to know exactly what they would like done in the event of their death. Your Wishes in a Nutshell gives you the chance to record your own private thoughts and last wishes, including any informal bequests (make sure your sister-in-law doesn’t grab your Manolo Blahniks) and private messages. Write your own eulogy, say where you’d like to be buried – even suggest what you’d like to happen to your goldfish! It would be a comfort to others, should anything happen, that you’ve made your wishes known. Your Nutshell is totally secure, it’s password-protected at several levels and encrypted, and only you have access to your files. But if there’s something you’d like to share with someone else – maybe for a day, a month, maybe even forever – you can invite them in and share whatever you want to, whether that’s your social fixtures, your friend’s wedding with pictures, music and a scanned menu, whatever! 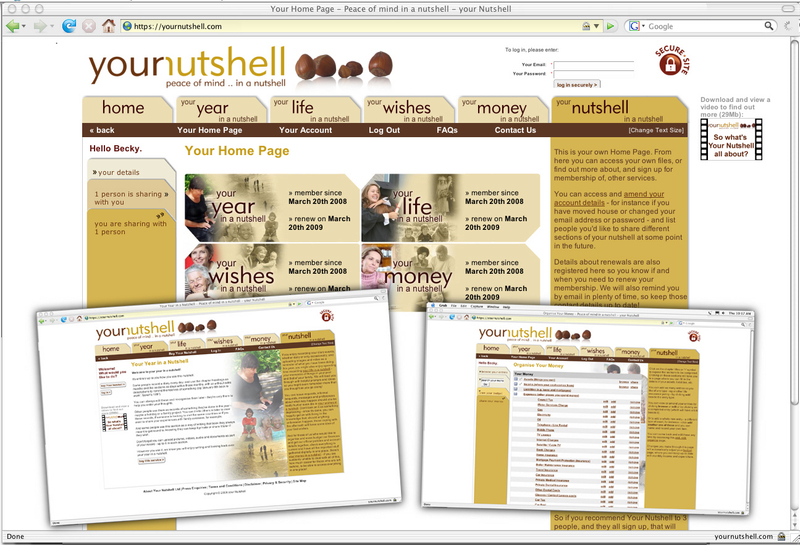 It’s easy to use and there are online videos to view about each different nutshell. It’s also a private place where you can rant in secret or celebrate your life, and keep a running commentary on your day-today events. It gives you something to look back on later, a reminder of what you were doing and feeling at any given time. Your year, your life, your wishes, and your money – it’s all about you and your life in a nutshell! The website launches officially on 1st July although it is already fully operational and being tested daily by an invited test panel – for content publication before that date, please contact Rob Thomas, Managing Director, on 0845 272 2382 or email rob.thomas@yournutshell.com. To receive free membership of the site for evaluation and your own enjoyment, please contact Rob - we’d appreciate your feedback. This press release was distributed by ResponseSource Press Release Wire on behalf of Your Nutshell in the following categories: Women's Interest & Beauty, for more information visit https://pressreleasewire.responsesource.com/about.